Dolphins have long impressed and entertained off the bows of boats with their acrobatic feats and playful nature. But there may be more to their interactions with humans than we thought. In fact, dolphins have a very sophisticated form of communication and have even attempted to connect with people. Few researchers are more familiar with these animals than Fabrice Schnöller – French engineer, freelance biologist, acoustic researcher and founder of the DAREWIN Project – who has been studying them for 10 years. Schnöller’s unique use of freediving (diving without a breathing apparatus) has allowed him to get more intimate interactions than previous researchers. If dolphins have been talking to us all along, is there a potential conversation to be had? Schnöller was skeptical, saying, “Conversation is the protocol of human communication.” Within a human interaction, both parties would introduce themselves and then alternate in speaking. With dolphins, it is quite different. “We are quite sure now that dolphins can do multiple communications at the same time with different animals…They are in a conference mode,” he said. Because dolphins use very direct, narrow beams of sound to communicate, it is easy for them to know that they are being addressed; they already know the message is for them. However, the source of the message is another matter. “They don’t know who is talking to them because sometimes the sound is coming from a transmitter and they don’t see it. So, if you were a dolphin, the protocol would be when you talk to me, you say your name,” he explained. 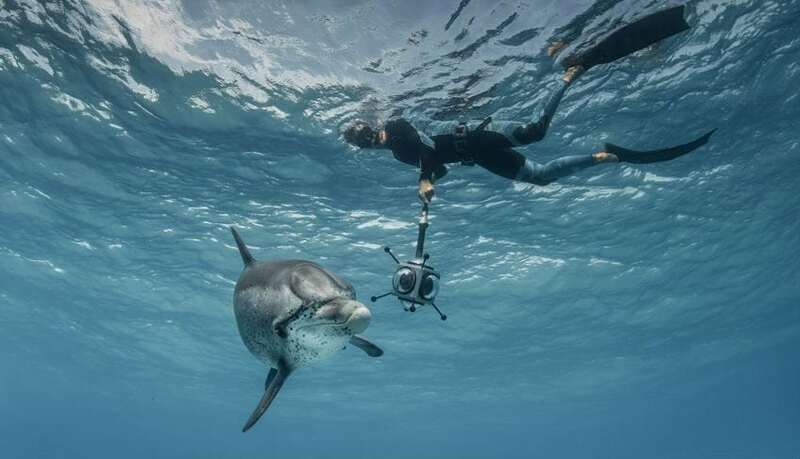 Adding to Schnöller’s research is his unique use of VR and 360-degree cameras to record dolphins in their natural habitat: “You need a camera in every direction, and you need an acoustic antenna so you can calculate and say, ‘I am sure it is this one that made this whistle.’” The fact that dolphins don’t actually move their mouths when they produce sounds makes it difficult to track which message is coming from which dolphin. But, with a camera in every direction, it’s easier for Schnöller to find out who’s talking. Rather than having many cameras pointed in different directions, the team can use the latest 360-degree cameras to capture their subjects. Schnöller believes that virtual reality has helped facilitate this by allowing people to come face to face with the animals in a way they would not have been able to do otherwise. As a result, they can learn that these animals have a sophisticated language, one which shows that they are more like humans than previously thought. “That’s why language, for me, is the most important thing,” Schnöller said.